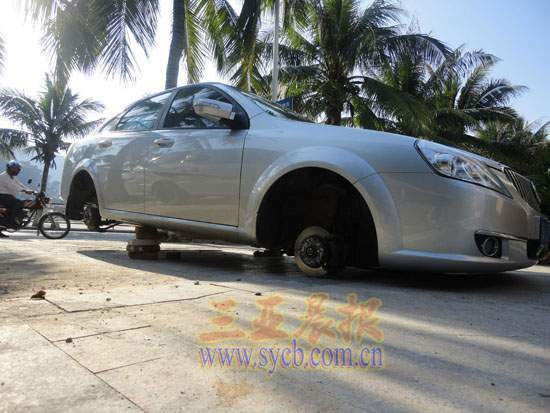 An owner of a car told police last Friday that thieves stole the tires and rims from his car while it was parked at Linchunhe Road. According to the owner’s report, thieves stole the wheels off of his car overnight and left it on blocks in his driveway. "When I was about to go to work around 7 am, I saw many people surrounding there and was surprised to find my car’s wheels gone and only left on blocks.” said the owner. According to residents living nearby, it is not the first incident in this district. Last year, another car parked there also faced the same fate. Many residents pointed out that thieves will take risks to stealing during the late night to sell the wheels for money. Police are searching for the people responsible for stealing the wheels after obtaining fingerprints on the spot.